I couldn’t find much in the media about the Dallas book signing. Rumor has it that TLC got exclusive access inside the event. If that’s true, then the footage will probably make its way into one of their shows in the future. Last go-round they featured Palin’s Minneapolis signing in “Mall Cops.” Spalaska.com is supposed to have some footage posted in the near future. I arrived at the Barnes and Noble bookstore at the very early hour of 2am. There were already a handful of cars in the parking lot with folks camping out in their cars. 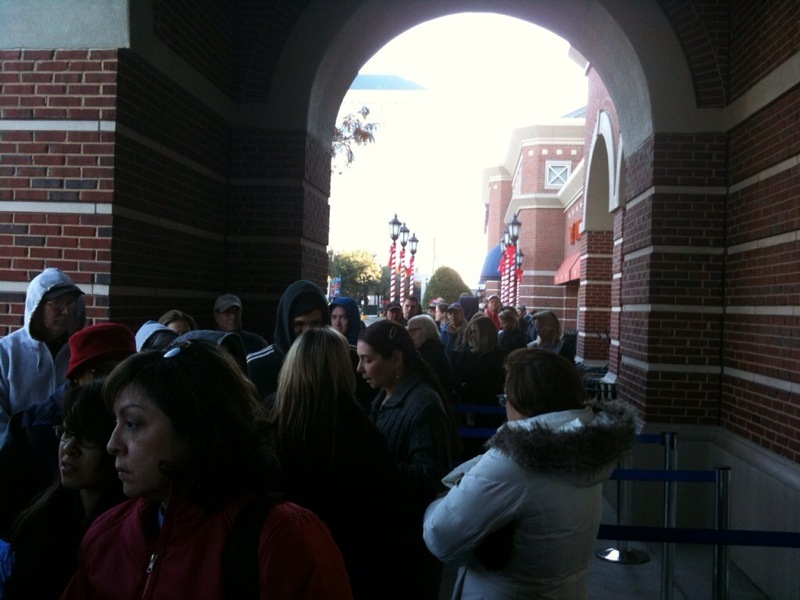 My friend and I decided to take the initiative and start the line, so we walked up to the doors and camped out. As soon as we did that, other people started jumping out of their cars to join us. We had about 5 people in line when the shopping center’s security patrol chased us off. Told us we couldn’t line up until the store opened. We sweet talked the guard into letting us line up at 4am. Since we couldn’t physically line up, we left folding chairs for our spots. More cars started showing up as the hour crept by more folding chairs appeared. Keep in mind, this was a full five hours before the store opened, where we were only going to receive wristbands, and then have to return later in the evening for the actual signing. The first press showed up at 8am. Channel 8 News interviewed me, but I can’t for the life of me find the link. A friend said he saw my little interview on the evening news. The media zoo wasn’t going to begin until much later in the day since that was when Palin was set to arrive. I’ve included a picture of the 9am crowd. About a 100 people were in line. We were people who already purchased books. We received our wristbands in groups of 50. 50 A green bands. B, C, D, then on to yellow and purple for the next group. We were told to take off, mill around the store, or do whatever until the line started up again at 4pm. We took off to eat breakfast and waited around until 4pm. We miscalculated by waiting inside, thinking that the line would start there, but they began lining people up outside according to number and color of wristbands. It got really packed. People walking by were asking who the huge crowd was waiting to see. A few weeks ago, GWB had a signing in the area. When told about Palin, people rushed inside to buy books and get in line. At 4pm sharp, the Barnes and Noble staff directed us inside and at the base of the escalators we were checked for cell phones and purses and jackets were searched. They snaked us around the bookshelves and we waited. The staff circulated the word that Palin’s plane arrived early and that she would be signing books 30 minutes earlier than scheduled. Yeah. So I wanted to redeem myself this time and actually talk to the woman. I then turned to leave and even though Willow and Piper were standing at the end passing out book marks I just remember receiving one from Piper and saying, “Thanks, kiddo!” Goober. I really wanted to fist pump Willow and say “Right, on girl! You defend your peeps.” but that would’ve been A) not appropriate and B) you’d have to assume I’d remember to say that. Here’s the funny thing. I was so elated about my encounter that I just grabbed a signed book that was handed to me and walked off. However, I had paid for two books and walked up to the table with two. I looked down: I only had one book. Panicked, I rushed downstairs to tell the staff of my problem. I was escorted, yes, escorted back upstairs where I was told to chill with Palin’s security detail while a staff member snagged me a book. The security guy was practically holding my hand so I wouldn’t go anywhere. That’s how tight security was. I was very pleased to see Palin was well guarded. Once the signing started, phones and cameras were not allowed inside. Since the Salon guy was treated like every other mook who showed up, he couldn’t take pictures of people lined up inside. And he stated he showed up midday. Well, the signing didn’t start until 5:30pm. Of course there wasn’t a crowd at noon. We were all told to scram until 4pm. Look, I’ll grant you that the Legacy Bookstore did a better job of advertising Palin’s signing and had a better operation than Barnes and Noble. However, the contention that Dallas wasn’t as big as last year’s signing because Dallas is more Democrat doesn’t square away with the giant showing down in the much more Democrat heavy center of Houston. I mean Bill White declared the city a sanctuary city! I had a wonderful time and my encounter with Palin was twenty times better than my first encounter with her. What these journalists fail to understand in this new age of media is that they’re not the only ones with access to cameras and computers. Each one of us is a citizen journalist and while he had his view of an event, I have mine. It’s up to the reader to determine which one of us has more credibility. As Dark Tides can attest to, when you wear C4P gear or mention the meet up in Chicago, Palin’s face just lights up. She really, really appreciates this site and the people on it. I wish I had more time to tell her the names of Nicole, Whitney, Ian and Mia, Cruela, Bee and I desperately wanted to tell her to be sure to look out for a petite lady with silver hair and wicked tongue out in TN who goes by the name of Bean Counter and give her a big old huge. But man, 2 minutes goes by quickly and I couldn’t fit that in! Lots of folks loved the show (Sarah Palin’s Alaska, of course) and were trying to get home in time to see it. Interestingly, many said they aren’t able to watch it on Sunday night but they DVR it and watch it later in the week.